This example shows how a MVC4 solution can be setup together with a WiX installation project. To create a msi installer for a MVC4 project, the solution needs to be built, then the web project must be published, the WiX project harvests the published output and creates an msi installer. The solution is configured so that in debug, the WiX project isn’t built (Only in release.) This is because a clean build in visual studio will not work unless the web project is published. This is different to VS2010. Here the web deployment project was used. 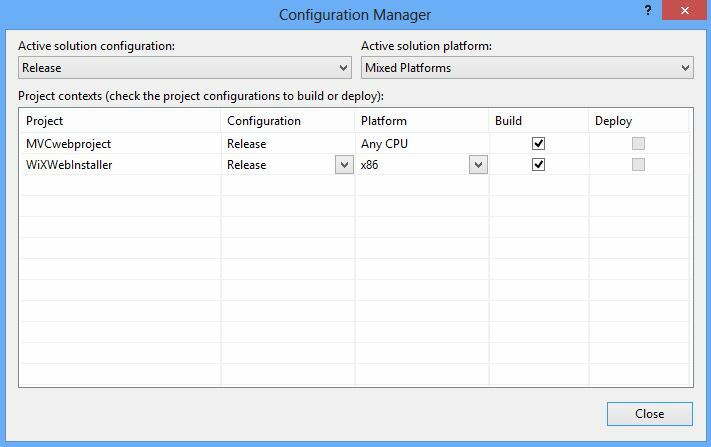 The Configuration Manager is configured as shown in the 2 images. I also left RevisionNumber parameter in the msbuild. This is not wired up in this example, but in a productive system, this should be defined in the WiX project and your build server. With this, a msi can be created for the deployment of MVC4 projects using VS2012. This installer can then be used in an automatic deployment for testing and release management. Why a WiX msi and not web deploy? The web deployment is only for web projects and cannot be extended, for example adding an extra window service or a self hosted rest service. The installation procedure is also less complicated with a msi. Automatic deployment in your software process will always work with a msi installer, this is not the case with web deployed. Other similar extension points exist, see Wix.targets. This all works great from the command line, but the WiX project fails to build in VS with error “Unresolved reference to symbol ‘WixComponentGroup:SimpleWebAppGroup’ in section ‘Product:*’.” How do I get the solution to build clean in VS? @Dave Shine: I had the same problem. You can solve this by publishing the web project (this generates files that do not belong to the source code). Right click the selected project. You will see the publish option in the menu. The publish profile is already present and filled in. Just click Next > Next > Publish. After that the build of the wix-project will succeed. After that my problem begins: how and when is the actual website created? It seems that the concrete create is not included in this installer? Nevertheless, thanks Damien for the nice article. … do not forget to build the installer project for Release | x86 configuration.